One of the main ways UMF supports small-scale coffee farmers is by purchasing, importing, and selling their coffee. We purchase coffee directly from the farmers that produce it, and we pay based on quality—if a coffee scores higher in an objective tasting test, we pay a higher price for it. A common question we get is “How much more are farmers getting paid for this coffee?” The short answer is, well, it depends on the quality of the particular coffee in question. We pay above Fair Trade prices for all coffees that we purchase, but there isn’t a simple fixed price we pay all farmers for their coffee. While this answer may be adequate for some, we’ve always felt that we’re only half-answering this important question about how our program supports farmers. Therefore, we will begin publishing the prices that we pay to each and every farmer, starting with this year’s harvest. This allows anybody to compare the prices we pay with the prices paid by other coffee purchasers (provided they publish this information). One important note—UMF only purchases parchment coffee, or coffee that hasn’t yet had the shell removed. The price per pound in parchment is the only truly representative number of what we pay farmers. This number is calculated as the amount of money that we directly pay the farmer divided by the amount of coffee the farmer sold to us—giving price per pound. In 2012, we signed contracts for parchment coffee with each farmer in our La Unión office, and paid exactly this amount to the farmer. No hidden prices or complicated math; it’s the most transparent number we can provide. UMF purchases parchment coffee, which is coffee that still has the shell attached. UMF received and cupped 132 different coffees from 84 different farmers in the 2012 harvest. From these candidates, we selected and purchased the best 49 coffees from a total of 31 farmers. Eleven of these farmers participate in UMF’s microloan and training programs. In all, we purchased a total of 54,830 lb of parchment coffee from farmers. 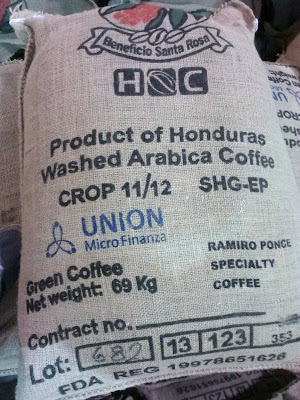 Next, we sent the coffee to a processing center in Honduras to remove the parchment and prepare it for exporting. This left us with 38,354 lb of green coffee, ready to be exported to the United States and sold. The smallest amount of coffee that we purchased from a farmer was 61 lb of parchment coffee, and the largest amount was 5,000 lb of coffee. The highest price that we paid was $1.98/lb parchment, and the lowest price paid was $1.62/lb parchment. Coffee is generally sold either as fruit (cherry), parchment coffee, green coffee at the farm it was produced, or green coffee FOB the port of export. There are variable processing losses and costs that occur between fruit, parchment, and green coffee. There are also variable costs incurred for export preparation, transportation, taxes, and licenses between green coffee at the farm it was produced and green coffee FOB the port of export. Many farmers sell their coffee in one form, but coffee buyers report their numbers in another. The variability between each of these stages leads to the reporting of numbers that are inherently nontransparent. The only number that we consider transparent is the price per pound in the form that the coffee was purchased. UMF purchases parchment coffee, so this is the only number that accurately reports the price that we paid farmers—price/lb parchment. Once the shell (parchment) has been removed and coffee has been sorted, the green price can be calculated. We also report price/lb green and price/lb green FOB Puerto Cortés, HN. These numbers are included to provide a benchmark for comparison to numbers that other companies and organizations report. It’s important to remember that, by virtue of how these numbers are calculated, they’re estimates. 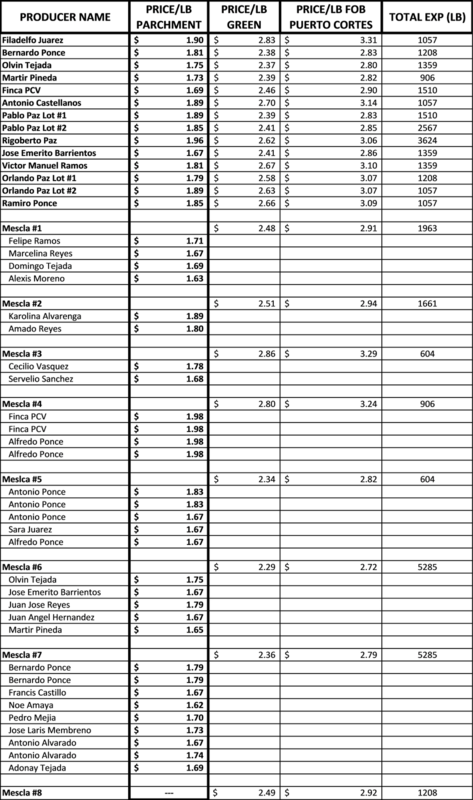 The formulas that we use to calculate price/lb parchment, price/lb green, and price/lb FOB Puerto Cortés are included in the glossary at the end of this report. The FOB price of a coffee is determined once a coffee has been processed, packaged, and shipped to port. • Firma (Signature): This contract was signed in UMF’s La Unión office by Alexis and Charlie Heins, UMF’s Financial Accounts Manager. This contract is just one of the 44 contracts signed with 31 farmers. It’s an example of the only sort of transparency that we consider to be complete. We know exactly how much each farmer is being paid for their coffee because we are sitting at a table with them when the contract is signed; there’s nobody else in the middle. There are a few parts of this document which may need more explanation. A mezcla is the Spanish word for “blend”—we refer to any coffee that combines more than one farmer’s harvests as a mezcla. There isn’t a price/lb green or FOB reported for any coffee that was part of a mezcla. During the parchment removal process, the amount of weight a coffee loses varies. The coffees are mixed before parchment removal, so there isn’t a way to accurately state the processing loss that occurs for each farmer’s coffee. We use the sum of all contracts and the total amount of green coffee to calculate the average amount that all farmers were paid. This prevents us from reporting green prices for individual farmers whose coffees are part of mezclas—there just isn’t an accurate way of doing so. Another peculiarity is the lack of price/lb parchment for Mezcla #8. 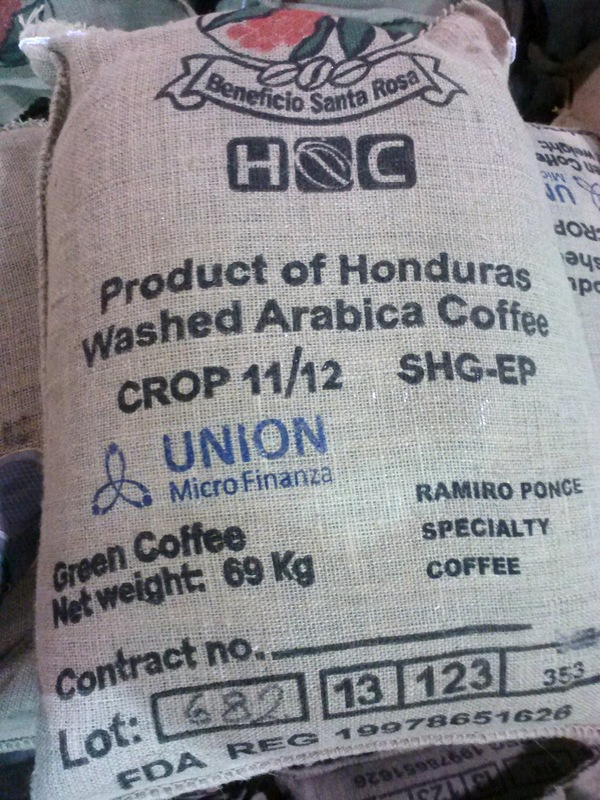 Coffee can only be exported from Honduras in 151 lb sacks. Typically, the amount of green coffee isn’t an exact multiple of 151. (For example, after processing, the amount of coffee we purchased from Rigoberto Paz came to 3,739 lb. We shipped it in 24 sacks for a total of 3,624 lb -- 115 lb short of the total he sold us.) Mezcla #8 is comprised of this leftover amount from all of the microlots. The green price is calculated using a weighted average of the amount of coffee from each farmer that went into Mezcla #8 and the green price of that coffee. It’s an estimate, but it’s as close as we can get to an exact price for the coffee. You may notice that some farmers appear more than once on this document. This occurs when farmers sell us more than one lot of coffee. We cupped each lot separately, and if the flavor profiles were different, we kept them separated. Farmers like Bernardo Ponce appear both as a farmer who exported a microlot, and a farmer who contributed to a blend. He’s the same farmer, but he sold us two separate coffees with distinct flavor profiles. This document represents several years of work both by UMF employees and the farmers that we work with. It’s the first time that we’ve published this information, and we ask that you understand that it’s still a work in progress. We’re already planning improvements for next year’s transparency report, and we encourage any feedback or suggestions. That said, we firmly believe that this document accurately and transparently represents the prices that we purchased in the 2011–2012 harvest. “How much do you pay farmers for their coffee?” isn’t the easiest question—but now we’re proud to have a more complete answer. There are several ideas that are presented in our Transparency Information that probably aren’t familiar to you if you don’t work in the coffee industry. We’ve tried to explain the basics above, but if you’d like more information—and especially if you’d like to compare our prices to those paid by other coffee buyers—please refer to the glossary below. Parchment coffee is coffee that has been picked, processed, and dried, but has not yet had the shell (parchment) removed. All coffees that UMF purchases are “in parchment” since local farmers don’t have access to the equipment used to remove it. Green coffee refers to coffee that has been processed to remove the parchment. Removing the parchment from coffee decreases its weight, but the exact amount of this weight decrease can vary. Parchment coffee prices are rarely reported by other organizations, so we include the amount that farmers were paid per pound of green coffee that they sold us. Since the amount of weight lost when processing parchment coffee into green coffee can vary, this number isn’t a completely accurate representation of the price we paid to farmers. For example, we paid both Antonio Castellanos and Pablo Paz (Lot #1) the same parchment price. Due to a higher processing loss for Antonio’s coffee, we were left with a smaller amount of green coffee in his lot. This means Antonio’s green price is $0.31/lb higher than for Pablo’s coffee—even though the parchment price is the same! Of the three prices reported, this is the only one that includes money that was not paid to farmers (unless the farm is large enough that it has its own mill for export preparation and the farmer is able to directly export coffee). This price includes all transportation costs, export preparation costs, export licenses, and taxes. We include it as a reference since it’s commonly used by others. But it’s important not to confuse this price with any sort of price paid to farmers. It’s the least transparent of the prices—a high FOB does not necessarily indicate a high price paid to the farmer. The last two words in this term, Puerto Cortés, refers to the seaport that all Honduras coffees are shipped from. You’ll encounter the term “Price/lb FOB Puerto Cortés” when comparing other Honduran coffees, but the last part of the term will be different when looking at coffees from other countries. The Spanish word for blend. When we combine multiple farmer’s harvests into a single coffee to sell, we call that coffee a mezcla. All our mezclas are made up of coffee solely from La Unión. Since the coffee all comes from the same region, many other coffee buyers would refer to it as “single origin.” However, since our mezclas are comprised of coffee grown by multiple farmers from multiple fields, we insist on calling them blends. Total Exp (lb): The total amount of green coffee exported by a farmer. Because the coffee used in mezclas were combined prior to the parchment removal, this number is not available for farmer’s coffee that was used for mezclas. I arrived in San Pedro Sula on May 22, only a week removed from finals at Notre Dame, with three complete strangers. Nine weeks later, I count those three strangers among my closest friends. My experience working with Unión MicroFinanza has also permanently changed my outlook on development. Working individually with UMF’s 178 loan clients introduced me to the “why” of UMF’s mission, and I thoroughly enjoyed each interaction with our clients. Each client presented a different story, a different need, and a different outlook, but it was easy to see one major similarity: all were genuinely excited to enter the loan program and begin a partnership with UMF. Intern responsibilities shifted on June 29 with the arrival of the first Community Partnership Project group. A series of three amazing groups from different churches arrived and departed, each having a unique experience working with the community of one of the outlying villages. The group that I worked directly with, from Life Church of Fort Collins, Colorado, visited San Agustín, one of the poorest communities that UMF partners with. We worked on installing water filters while building community relationships, which was incredibly fulfilling on all fronts. Having the ability to share La Unión, which I have grown to love, with new people was the highlight of my summer. 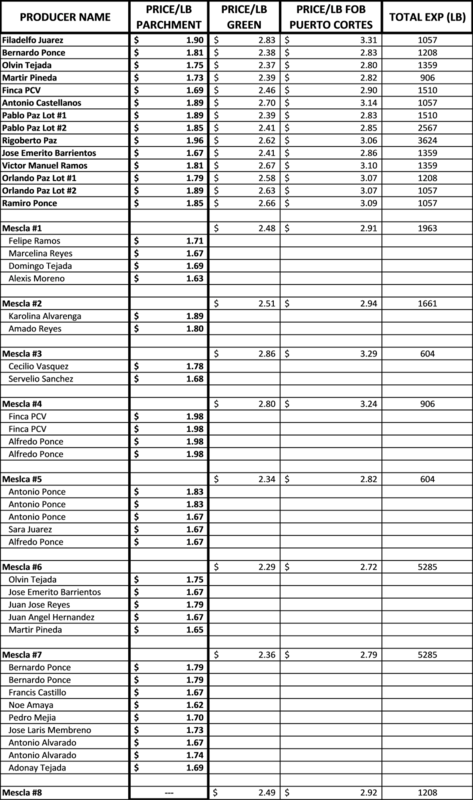 Friday, July 27, I depart La Unión. San Pedro Sula will no longer feel like a foreign city in a far away country, but a biting reminder of how short my journey was here. 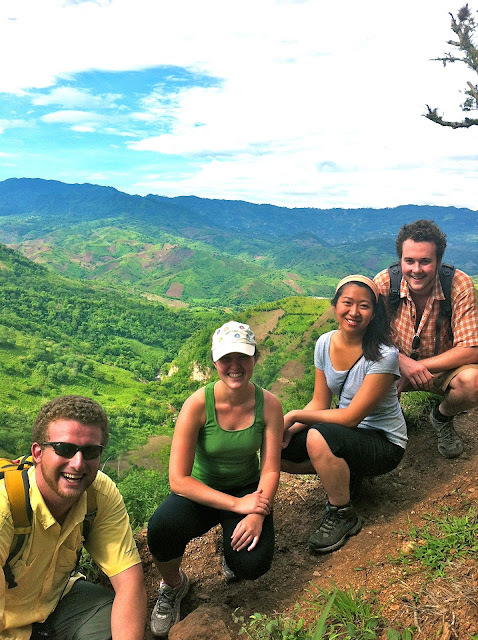 In Honduras, I witnessed firsthand the outstanding work of UMF, contributed as I could, and changed my outlook on life. My support for UMF will continue in the future, but not being able to walk down the hill to the office, hear the friendly motorcycle honks, exchange pleasantries, and frequent the pulpería will be missed. This summer has taught me more in ten weeks than I could have ever imagined, and I am grateful to UMF for the opportunity to be here.